This topic contains 0 replies, has 1 voice, and was last updated by Ryan 4 months, 3 weeks ago. While some people find solace in music or arts, others find it in food and cookbooks. Whether you’re a beginner cook or a professional chef, cookbooks are always there to hold your hand and guide you through the spices and vegetables stocked up in the kitchen. 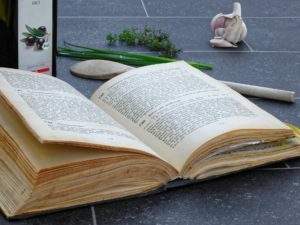 However, it can be a little difficult to know which cookbook to refer to which is why we’ve taken the time out and mentioned some of the cookbooks you absolutely must try! Written by Irma S. Rombauer in the year 1931, this book has many new editions published and hasn’t failed to disappoint its readers. It’s especially perfect for beginners giving them a step –to-step guide and guess what? Julia Child, the chef and author of her own cookbook also learned cooking through this. Speaking of Julia Child, here’s one of her books that is definitely something you should have with you. It’s also one of New York Times best seller, you may also have heard of it from the movie “Julia and Julia”. One word: Desserts! Written by Dorie Greenspan, this book is perfect if you have a sweet tooth. Nothing like chocolate and desserts to get you through the day! Exquisite food with excellent photography, Nathan Williams brings you a cookbook written in a completely unique way. It’s a different perspective to cooking that’s definitely going to be worth your time! Isa Chandra Moskowitz brings you a book that addresses your vegan diet with wild cooking and delicious meals for your everyday life. The above mentioned cookbooks are a must have if you love cooking. They will give you all the essential tips and tricks to make your food all the more special. This topic was modified 4 months, 3 weeks ago by Ryan. Cupboard Cookbook is home to all of the recipes you know and love!